Relations between Singapore and her immediate Malay neighbours have been perennially fraught with tension and misunderstanding. In making sense of this complex relationship, Lily Rahim explores the salience of historical animosities and competitive economic pressures, and Singapore’s janus-faced security and foreign economic policy orientation and ‘regional outsider’ complex. Focusing on Singapore’s relations with Malaysia, the book also examines the Indonesian dimension in bilateral relations. It highlights the paradoxical similarities in the nation-building approaches of Singapore and Malaysia. The author reflects critically on sensitive issues such as the rhetoric and reality of meritocracy and multiracialism in Singapore, and analyses the city-state’s weak regional soft power credentials and reputation as a political laggard despite its economic achievements. 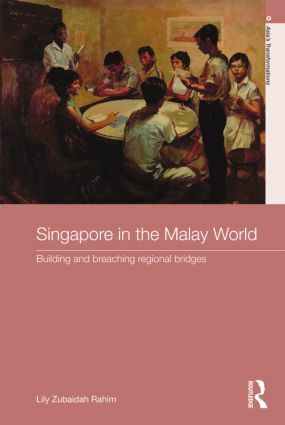 Incorporating perspectives and frameworks from the disciplines of comparative politics, area studies, international relations, political economy and history, this multidisciplinary study offers groundbreaking insights into the way in which the neighboring states of Singapore and Malaysia see themselves, each other, the region and beyond. This book will be of particular interest to keen observers of Southeast Asian politics. Singapura: Siapa nama kamu? Di-mana awak tinggal? The singa and garuda: From kiasu to soft power diplomacy?